It was a novel idea at the time and I had no idea what prompted it. But it made sense, and it resounded with me. Every day, we all have countless opportunities to show kindness and improve other people’s outlooks and their lives. I’m lucky to have a job where I frequently have opportunities to help co-workers. I handle internal communications in a large organization, and lots of people want to spread the word about the things they’re working on and are interested in. And almost everyone wants information they need to know to do their jobs. It makes me feel good to help people accomplish their goals (even though I do get paid to do it, and it’s my job). And every so often after an interaction (phone call, email, chat in the hallway), it occurs to me that there was a chance to be helpful and kind and I acted on it and took it a step further than strictly necessary. It’s a good feeling. I also try to consciously appreciate the kind things other people do for me — and remind myself that they didn’t have to do what they did, but how nice it was. One morning this week, I received and read a personal email at home before going to work that left me feeling like I’d been slapped in the face and like I was the lowest person on the face of the earth. I walked around kind of stunned from it until 10 a.m. But then someone I don’t know well called to discuss a project we’re working on together and took the time to say he really enjoys the weekly blog summary I send employees, and he wanted me to know. What a nice thing to do! As the old saying goes, everybody’s dealing with some issue in life. And it goes to follow: If that man’s one-minute comment made me feel so much better, then the small kindnesses I can do for other people might have the same effect on them. Kindness counts. What are you going to do next to make the world a better place? 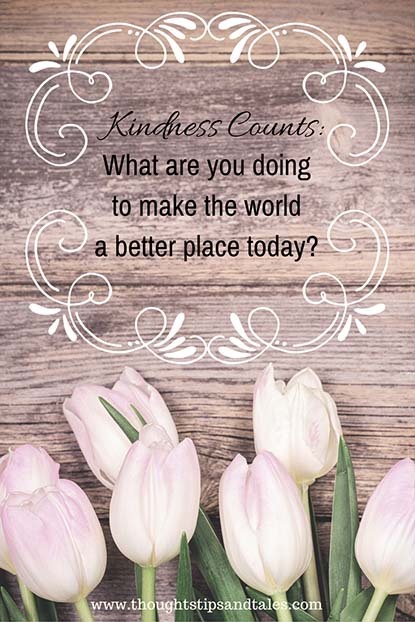 This entry was posted in life and tagged kindness counts, make the world a better place, what are you doing to make the wrold a beter place. Bookmark the permalink. Yes, that’s so very true. People don’t often realize the power words have and how they can easily ruin a person’s day with them – or make a day wonderful! I’m always amazed at how thoughtless some people can be but then, as you said, all it takes is one person’s kindness to make it all better!